Gustav Adolfs Torg (Torg = Square) is the story of a place whose importance has waxed and waned through the centuries as the city surrounding it changed. At one point in time it was centrally located and busy, but it is now a bit out of the way and without the opera house it would probably be nearly deserted. Geology plays a big role in the square’s history, so I’m going to have to back up to Stockholm’s beginnings. A high and steep ridge called Brunkebergsåsen (roughly translates to “Steep Cliff Ridge”) runs through central Stockholm, but it is now mostly unnoticeable as it has been integrated into the city’s fabric and because the ridge has been hacked away throughout the last millennium. It was originally about 60 feet higher than it is today, and it originally ran all the way to the water’s edge. Medieval Stockholmers used the ridge’s point as a source of granite and gravel, and by the 1500’s the ridge was completely leveled by the water. 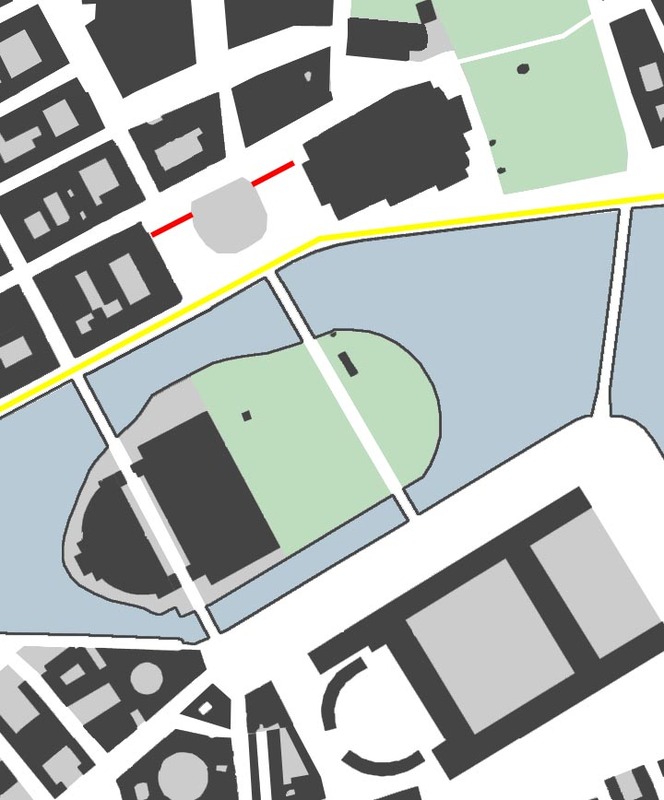 This flat zone is today’s Gustav Adolfs Torg (Map 1). The ridge has always divided Norrmalm (downtown Stockholm north of Gamla Stan, Old Town) into two halves, and most city planners have acknowledged the challenges posed by the ridge in their plans. Stockholm’s earliest urban plan shows two different street grids on either side of the ridge, and these two grids meet at Gustav Adolfs Torg. Even though the square wasn’t formally designed or built, it was still used in the 1600’s for important events such as Queen Kristina’s crowning in 1650 and for Karl XI’s coming of age ceremony (which was the first step before he was crowned) in 1672. Queen Kristina's Triumphal Arch (4) and Karl XI's celebratory tower (5) in the square. In 1654, architect Jean de la Vallée presented a plan which called for an axial parade avenue from the place (Map 2), over the water, through Gustav Adolf’s Torg, and through Norrmalm all the way to the water at Brunnsviken. Vallée's big idea was to make Stockholm’s Castle visible from Brunnsviken. This plan was never executed, but the idea would pop up over and over again throughout the next 300 years. In my post Stockholm’s Castle and its Environs, I wrote about how Tessin’s palace plan from 1713 extended the pomp and grandeur of the palace across Helgeandsholmen and even into Norrmalm. An axial bridge from the palace’s entry, across the island, and to the mainland at Gustav Adolfs Torg was to culminate in a new, monumental royal burial church. Two identical government buildings were to frame the other two sides of the square. Monuments in the middle of the square would further monumentalize the space. In Tessin’s plan, Gustav Adolf’s Torg became a formally important bookend to the city’s major parade axis—the palace served as one focal point and the Square with its gigantic church served as the other. 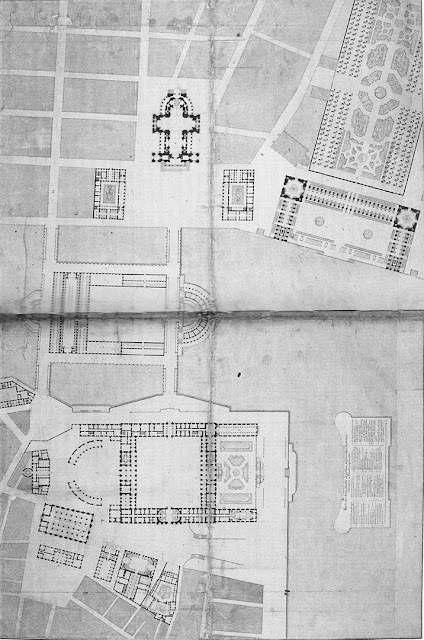 Like de la Vallée’s plan, Tessin’s plan for Gustav Adolfs Torg was never executed, but it was never forgotten, either. Several disadvantageous wars, constant internal strife nearly leading to civil war and culminating in two bloodless political coups, and several famine years meant that the Crown’s and the city’s attention was not focused on creating a grandiose urban environment throughout the 18th century. While Gustav III was extremely interested in building pompous palaces and parks later in the century, his dissatisfaction with politics as well as with the stifling royal court in the city led him to focus on the creation of Haga Park just outside of the city. Haga was a retreat outside the realm of politics and away from the gossipy court. Although Gustav III’s focus was not on city planning and development, part of Tessin’s plan for Gustav Aldolfs Torg was finally put into action during Gustav III’s regime. The wooden bridges were in bad repair and needed to be replaced. Instead of replacing them with similar make-shift bridges, City Architect Adelcrantz drew plans for a robust stone bridge in the 1780’s. 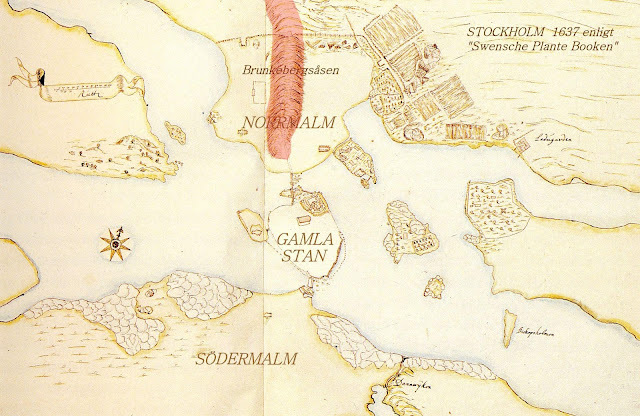 The previous bridges had been crooked as they landed on Helgeandsholmen, but the new bridge was an axial straight shot from the palace to the Square according to Tessin’s plan. Although it doesn’t looks too impressive today, the new Norrbro (“North Bridge”) was a feat of engineering for its time and it has withstood spring floods ever since it was finished in 1807 (Map 3). Adelcrantz’s plans also called for a row of fish warehouses and meat slaughterhouses along the bridge across Helgeandsholmen. Gustav III didn’t think these buildings fitting for an axial parade route from the palace to the square, so these buildings were moved to Blaiseholmen instead (Map 4). It is easy to see how both the square and the water facades are replicas of the Gustavian opera house. A showy statue of Gustav II Adolf was placed in the middle of the square in 1791. 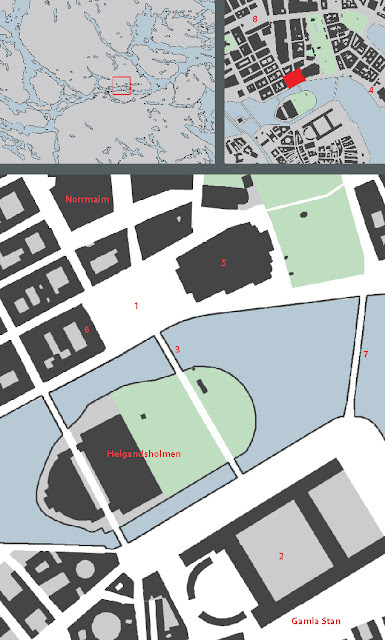 Now three of Tessin’s four objectives with Gustav Adolf’s Torg were complete. 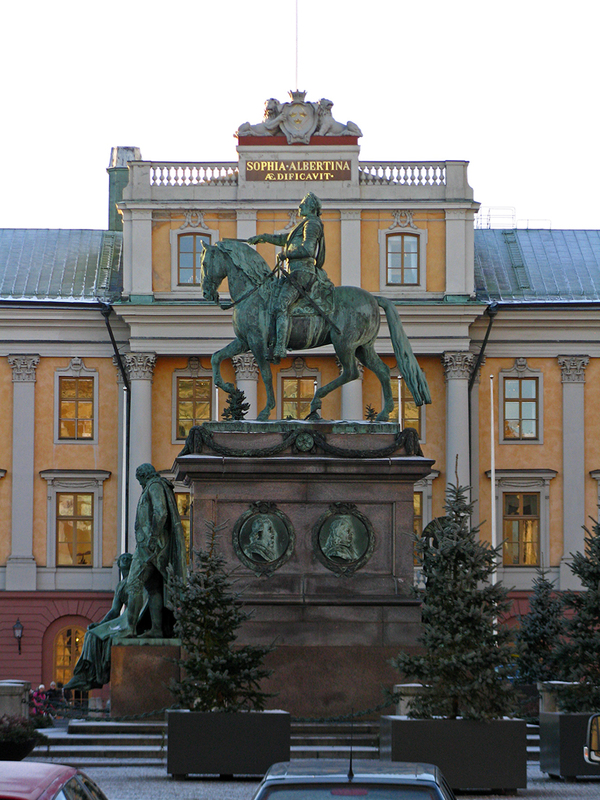 An axial bridge connected the palace and the square, the square was flanked by grand matching buildings, and the square was even accented by statuary. The only thing missing was the new royal burial church to complete the axis, but it does not seem that Gustav III ever had any plans of building it. 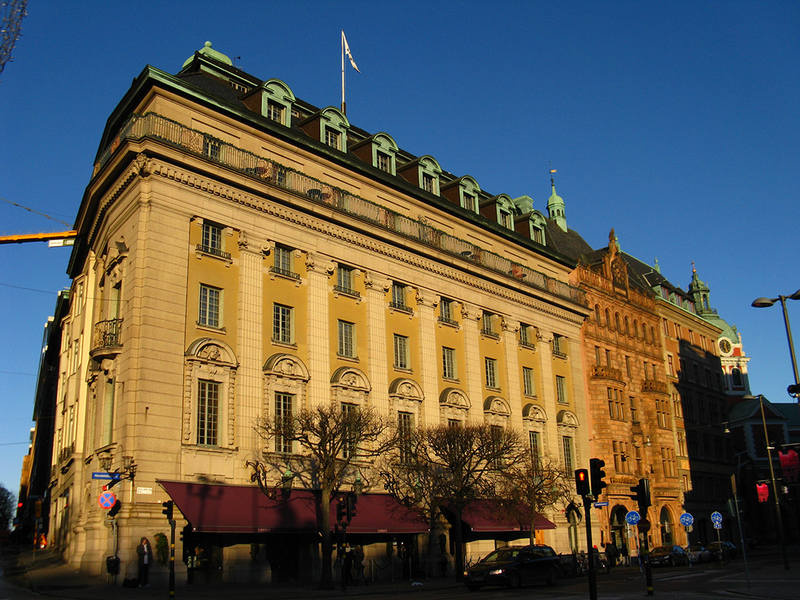 Instead, the fancy Hotel Rydberg was built on the northern edge of the square in 1857, and its café and bar was popular with Stockholm’s intellectual crowd. By the 1900’s, the hotel was replaced by bank buildings which symbolize yet another shift in Norrmalm’s character from cultural mecca to place of business. This shift is probably partly responsible for the lack of pedestrian life in the square. One of the bank buildings on the northern edge of the square. 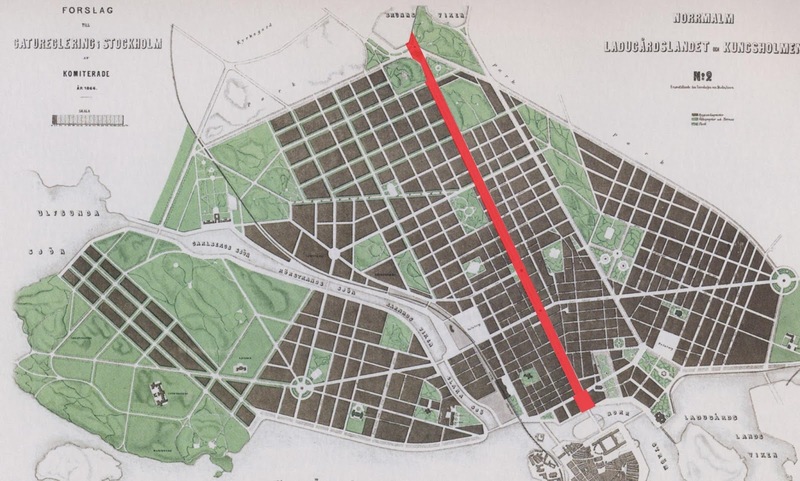 Jean de la Vallée’s idea of a formal, axial avenue stretching from the palace to the water’s edge at Brunnsviken was reimagined in the Lindhagen Plan of 1866. Heavily influenced by Haussmann’s Parisian boulevards, this new Sveavägen (“Sweden Road”) was monumental in scale at 240 feet wide, and it dominated the entire cityscape. This boulevard was never built as envisioned—while Sveavägen does cut through much of Stockholm, it doesn’t reach all the way to Gustav Adolf’s Torg and the boulevard is definitely not as wide as originally designed. If Sveavägen had been built according to the Lindhagen Plan, Gustav Adolfs Torg would still be an integral and central part of downtown Stockholm today. In the 1880’s the opera house was in bad repair and had severe damage due to settling foundations. The building was torn down and a competition was held for the design of the new opera house. The winning entry retained the original 18th century facade, but the 2nd place entry which called for a new facade was the design that actually ended up being built. 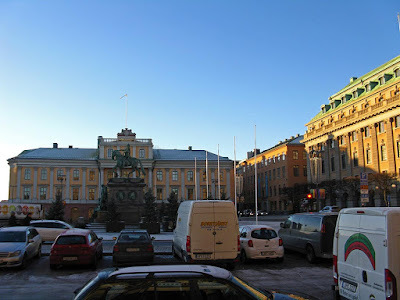 The new opera was opened in 1898 and it is loved by Stockholmers today, but Gustav Adolfs Torg lost some of its pomp and its formal, ceremonial nature when the opera no longer matched the building directly across the square. 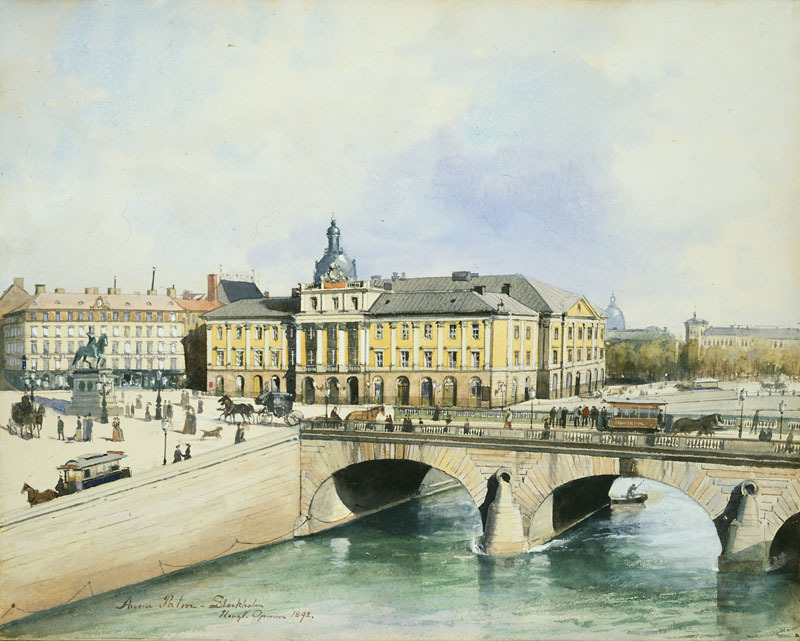 Gustav Adolfs Torg’s importance as a prominent and busy place in Stockholm was further eroded in 1946 when the new Strömbron bridge (Map 7) was built from Gamla Stan (The Old Town) to the mainland. This bridge was originally meant as a temporary solution to relieve traffic across Norrbro, but a different solution was never built, and today it is hard to imagine that a traffic calming measure was ever needed in the square. Traffic originally drove haphazardly across the square, but in the early 20th century the traffic flow was defined by specific lanes. Throughout the decades, the square became less and less a place to be while it became more and more a traffic circle. Today, it is a pleasant traffic circle as far as traffic circles go, but the square is dominated by cars and is not frequented by pedestrians. A small but busy parking lot directly in front of the opera house strengthens the sense that cars dominate the square. The pleasantness of the square-as-traffic-circle is mostly due to the fact that relatively few cars drive through. Strömbron took away much of the traffic, but later city planning measures cut off busy Sveavägen a few blocks north of the square at Sergels Torg (Map 8), reducing the number of cars even more drastically. Without the opera house, Gustav Adolfs Torg would see very little pedestrian traffic today. I am guessing that the opening to the public of the nearby park Kungsträdgården also helped to drain Gustav Adolfs Torg of its visitors and its importance as a gathering place. Suddenly, a much larger and greener space was available just a block away. Gustav Adolfs Torg has a curious lack of benches and greenery (except at Christmas time! ), and I wonder if simple but artfully placed benches and flower pots could entice pedestrians to stop in the square for a few minutes. 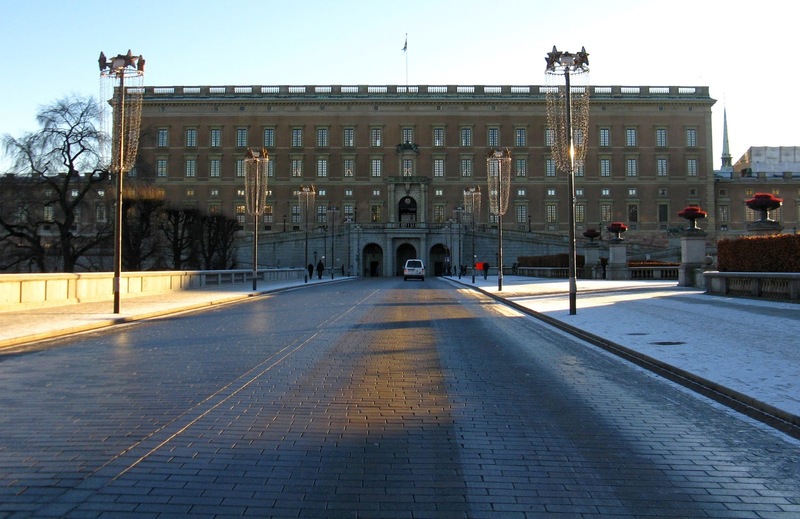 The square is often sunny at lunch, and Stockholm’s Slott is quite the grand view! The middle of the square is also inconvenient to reach today. The main pedestrian thoroughfare is along the water (yellow), but the only crosswalks into the middle are on the other side of the square. Simply adding a crosswalk from the main pedestrian path would be sure to invite people to linger in the square. This square is a good lesson in humility for modern city planners: spaces which are critically acclaimed and act as important gathering spaces today may be nearly forgotten tomorrow. It is also a lesson in how easily a public space can be dominated by automobiles, even when the traffic flow isn’t overly busy. The combination of car-dominance and pedestrian inconvenience is deadly for a public space.